My very sincere condolences to everyone. Gloria was one GREAT Lady! I wish you all peace and much love and wish I could attend any services but am in Albuquerque, NM. As our Mum passed on Dec. 26th, 10 years ago, we know how hard the holidays are. Our cherished memories comfort us as they will you. Bless all of you. Condolence: I am so very sad to hear of your mothers passing. I have such very fond memories of her kindness, wit and strength. My deepest condolences and prayers to the entire family. Condolence: Kevin, I am truly sorry to hear of the loss of your mother. Please accept our condolences to you and your family and may our prayers help comfort you at this time. I was sorry to hear of the lost of your dear loved one. May you find strength and comfort through the pages of the Bible where it reassures us that God will soon bring about a time on the earth when death will be no more. (Revelation 21:3,4) May this hope bring you peace. 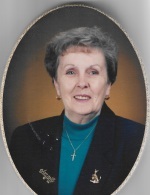 Condolence: Dear Patty and the entire Shaughnessy and extended family so sorry to hear of the loss of your Mom. Lots of great times were had during our teenage years, with your Mom putting up with our antics, over on Fitch Road. May she RIP, and all of your fond memories help you through this most difficult time.